LJ supports OpenID which if you have an aol account and other sign ins you can sign in with a url from that account here and have an "identity" to respond to posts on my journal. I also allow anonymous posting and posting from people who are not on my friendslist but you will have to go thru a little more work to post to my journal. I also screen comments from those not on my F-list. So if you want to be a troll no one will ever see it but me, so troll away and have fun going thru reCAPTCHA each time you do it, my hitting the delete will take much less time. 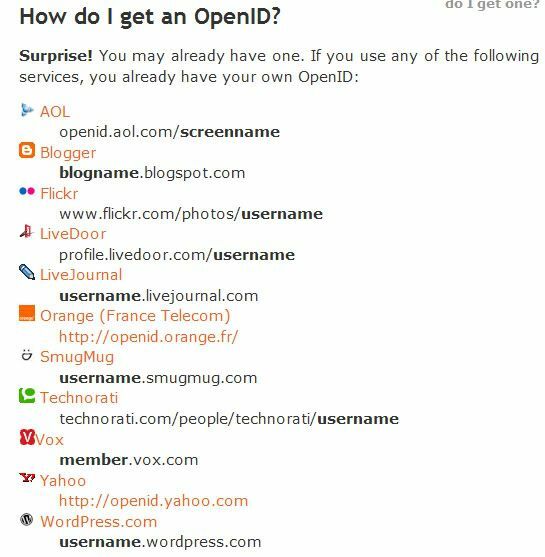 The list of some different accounts that you can use for your OpenID is http://openid.net/get/ so if you use flickr, yahoo, blogger, wordpress or aol (just a few of the big ones) you can use a URL from those to sign in to leave me comments (the image below tells you what URL that is). Yes, I am fairly boring but feel free to comment. I love to meet new people and know who has checked my journal out. Ok, I wanted to see how this OpenID thing worked. On yahoo you need to enable your OpenID. Sign in and then go into your information area (where you change your password and such there will be a link on the right that says edit/create OpenID and you will get a URL to use for your OpenID) to do that. it's really not that hard. I was able to get right on with my aol OpenID URL without having to enable anything. I thought we connected but when I said hello you said good-bye. Oh wait no that was the beatles. You said no and then left lol.